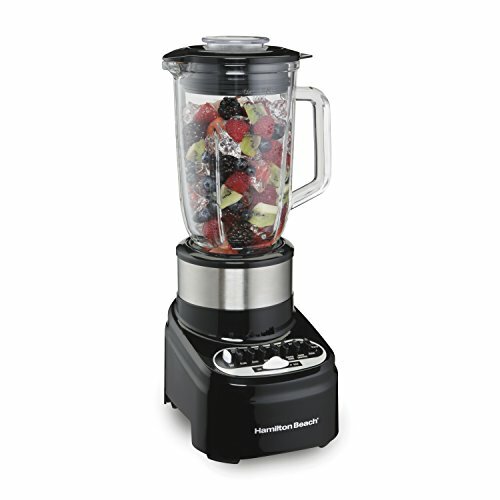 Hamilton Beach 54210 Blender with 40 Oz Glass Jar for Shakes and Smoothies, 14 Speeds, 800 Watts, Stainless Steel by Hamilton Beach at Just Gathering. MPN: B07BS3H5VF. Hurry! Limited time offer. Offer valid only while supplies last. Step up your blending power and capabilities without breaking the bank with the Hamilton Beach Multi-Function blender. The shatter-resistant, 40 oz. Step up your blending power and capabilities without breaking the bank with the Hamilton Beach Multi-Function blender. The shatter-resistant, 40 oz. glass jar, stainless steel blades and 800 watts of peak power work together to effortlessly blend icy drinks, puree hummus, chop up salsas, and much more. Each of the 14 blending speeds are labeled by function to eliminate guesswork, and a 2 oz. filler cap lets you add ingredients while mixing. Enjoy peace of mind with a 3-year limited and access to our US-based customer support team.